In 1895, Dr. Matthew Ricketts, a Republican and the first black member of Nebraska’s Legislature, sponsored a bill in the House of Representatives to repeal the prohibition on interracial marriage, which had been law since the first days of the Nebraska Territory. It passed by a vote of 54-15.1Omaha World-Herald, Mar. 31, 1895. From there it passed the Senate and reached the Governor, Silas A. Holcomb, who had been elected as a Populist with the support of William Jennings Bryan. On April 11, 1895, Gov. Holcomb vetoed the bill, reasoning that such a bill without due consideration could not possibly reflect the will of the people.2Omaha World-Herald, April 12, 1895. The Legislature, having adjourned sine die, had no opportunity to override Holcomb’s veto. Though there was some doubt as to whether Holcomb had vetoed the bill within the five days required by the Nebraska Constitution, ultimately the veto stood.3“Lincoln All Agog Over the Validity of the Veto of Three Bills,” Omaha World-Herald, April 17, 1895. Reaction to the veto was predictably tinged with racist, inflammatory rhetoric. The Crete Democrat said the bill “opened the gates that lead to racial destruction,” that it would “mongrelize the white race” and “destroy civilization.” “Just why men of ordinary intelligence would vote for such a measure is beyond the comprehension of the average citizen.”4Omaha World-Herald, April 23, 1895. Over a century later, we are left to wonder the opposite. Silas Alexander Holcomb was born August 25, 1858 in Gibson County, Indiana to John C. and Lucinda R. Holcomb (née Skelton). His grandmother on his father’s side was reportedly related to Robert E. Lee. After his father’s death in 1878, he moved to Nebraska with his family and took up the practice of law. By 1883, he had moved to Broken Bow, where he became involved in local politics. In 1891, he was elected as a district judge as the nominee of the People’s Independent Party. The party nominated him for Governor in 1894.5E.R. Purcell, “Governor-Elect Holcomb: A Sketch of the Life of Nebraska’s Next Executive,” Nebraska State Journal, Dec. 3, 1894. Holcomb was only thirty-six years old when he became Governor of Nebraska. The Populist Party’s history is intrinsically linked with Nebraska. In 1892, the People’s Party held a national convention on July 4 in Omaha, Nebraska, nominating James Weaver as its candidate for President.6Omaha Daily Bee, July 5, 1892. The platform adopted at that convention, known as the Omaha Platform, called for the free coinage of silver, a major issue in national politics at the time and an issue which Nebraska’s favorite son, Democrat William Jennings Bryan, would later use to rise to national prominence and the nomination of his party for President of the United States (and, ultimately, the demise of the Populists as an independent party). For now, though, Bryan was a Congressman, editor-in-chief of the Omaha World-Herald,7A note on the political slants of the World-Herald, the Journal, and the Bee, which given their prominence in my research, will be a topic worth revisiting. The World-Herald was a Democratic paper and publisher Gilbert Hitchcock would later serve as a Democratic U.S. Senator. The Journal was a Republican paper but frequently clashed with the Bee‘s publisher Edward Rosewater, also a Republican. The Bee‘s sensationalist journalism would become infamous given its role in the Omaha Race Riot of 1919, which resulted in the lynching of Will Brown and the attempted hanging of Omaha Mayor Edward Parsons Smith. and a candidate for United State Senate in 1894. Prior to the adoption of the 17th Amendment, Senators were elected by state legislatures. Bryan saw an opportunity to partner with Populist candidates to elect a friendly Governor and improve his chances of being elected to the Senate. The Democratic convention nominated Holcomb for Governor and boosted Bryan as their preferred candidate for U.S. Senate. “It was Bryan’s convention from first to last,” the Nebraska State Journal wrote, “and his followers rode rough-shod over all opposition.”8“Fusion Is A Fact,” Nebraska State Journal, Sep. 27, 1894. So Holcomb had the support of Democrats and Populists, as well as at least one prominent Republican. The Omaha Daily Bee was an important Republican paper at the time and its publisher Edward Rosewater notably broke with the party to support Holcomb over the Republican nominee, Lt. Governor Thomas Majors. This made Rosewater a frequent target of the Journal, which called him “the assistant populist.”9Id. The elections of 1894 were by and large a disaster for Democrats. Republicans won a large majority in the State Legislature and with it removed any chance that Bryan would be elected as Senator. Holcomb’s election was in doubt as well. The Lincoln Evening News10The Journal‘s Lincoln daily and predecessor to the Lincoln Journal declared “Majors The Man” the day after the election,11Lincoln Evening News, Nov. 7, 1894. while the Bee declared just as confidently “Holcomb The Winner.”12Omaha Daily Bee, Nov. 7, 1894. The World-Herald, despondent over Democratic losses across the country, could only ask “Is It Tom Majors?”13Omaha World-Herald, Nov. 7, 1894. The Bee had it correct, and went about alleging potential fraud by Republicans intent on electing Majors.14Omaha Daily Bee, Nov. 8, 1894. As it turned out, Holcomb was the only bright spot for Democrats and Populists. Republicans had swept nearly every other race, owing to the national mood against President Grover Cleveland and the Panic of 1893, as well as the deep divisions within the Democratic Party. Matthew Ricketts was born on April 3, 1858 in Henry County, Kentucky, to enslaved parents. After the Civil War, they moved to Booneville, Missouri.15W.A. Howard (1895), “Matthew O. Ricketts,” Biographical Sketches of the Nebraska Legislature, p.177 Upon moving to Omaha in 1880, Ricketts became a trailblazer in more ways than one. Working as a janitor at the Omaha Medical College (now the University of Nebraska Medical Center), he enrolled and graduated with high honors in 1884, becoming the first African-American to graduate medical school in Nebraska.16J.M. Wolfe (1895), “M.O. Ricketts,” Portrait Engravings of All the Members and Officers of the State Legislature, p.148 In 1892, he was elected to the Nebraska State House of Representatives as a Republican representing Douglas County,17Nebraska did not have single-member districts until after a Constitutional amendment in 1920. becoming the first black state legislator in Nebraska history. Dr. Ricketts was successful in his first term, securing passage of a landmark civil rights law which prohibited discrimination in public accommodations.18Editorial, “No better time to remember Nebraska’s civil rights pioneer,” Omaha World-Herald, Aug. 26, 2017. Sen. Robert Moore, who carried the bill in the State Senate, was elected Lt. Governor in 1894. Ricketts earned high praise from his colleagues and observers of the Legislature. “Dr. 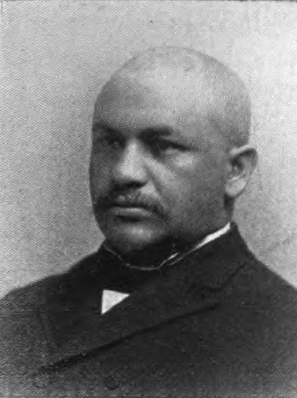 Ricketts is one of the best speakers in the house as well as a ready debater,” one biographical guide wrote.19Howard (1895), Biographical Sketches. He was reelected in 1894. Ricketts’ bill passed the House at the end of March, a few days before the Legislature was scheduled to adjourn. Ricketts called the law “a stigma upon his race,” according to the Journal. “They had earned equality before the law.”20“Caucasians and Negros May Marry,” Nebraska State Journal, Mar. 31, 1895. Ultimately, the bill was the victim of a (perhaps convenient) process argument. There does not seem to have been any debate on the measure in the Senate, and the news accounts of the day did not find the passage of the bill, or even its veto, all that remarkable or controversial. But the circumstances of the final day of the Twenty-Fourth Nebraska Legislature were enough to provide Holcomb with an excuse to veto the bill. The last day of the 1895 session of the Nebraska Legislature was chaotic and seemingly endless. A number of bills were left until the final hours, including an age of consent bill which Ricketts also supported, and the marriage bill. The World-Herald matter-of-factly reported on the Legislature’s work, still ongoing at a late hour on the morning of April 6, 1895. The passage of the marriage bill merited but a single sentence in its report.21“Gives Up The Ghost,” Omaha World-Herald, April 6, 1895. The bill passed the Senate without debate in the evening hours of April 5. The sensational details of the rest of the day’s business were left to the other papers to fill in, fixated on the fact that the Legislature was scheduled to adjourn at noon on April 5. “At 11:30 in the house and at an earlier hour in the senate the great clocks over the chairs of the presiding officials stopped through aid extended by the sergeant-at-arms with a step ladder,” the Nebraska State Journal wrote. “All through the day and the hours of the night the hands of the official time pieces declared the hour for adjournment had not yet arrived.”22“With Silent Clocks,” Nebraska State Journal, April 6, 1895. The Bee suggested something altogether more lurid. “Drunken orgie in cellar,” one heading announced.23“Its Tale Is Told,” Omaha Daily Bee, April 6, 1895. In the early morning hours of April 6, as the Bee tells it, “drunken men reeled about the hallway and danced on the lunch tables. Beer was free as water. Clerks, janitors, house and senate members were mixed up in one grand carnival of bacchanalian revelry.”24Id. The Legislature finally adjourned sine die at 12:35 p.m. on April 6, 1895, over twenty-four hours after the scheduled time for adjournment. Ricketts struck a collegial tone, “urging the members to forget all partisan feeling upon returning to their homes and to part with assurances of good will.”25“End of Turmoil,” Lincoln Evening News, April 6, 1895. On April 11, Gov. Holcomb issued his veto message. The headline-grabbing veto was on a bill for a new Omaha City Charter, but Holcomb laid out his reasons for vetoing the marriage bill as well. “[T]his measure was hurriedly passed during the closing hours of the legislative session, without consideration, many members afterward openly declaring that they did not know they had voted for the bill on its final passage,” Holcomb wrote.26“Vetoed The Omaha Charter,” Omaha Daily Bee, April 12, 1895. He argued that the bill could not possibly reflect the will of the people until it was given a full debate, and thus he was obligated to veto it.